The Tithe Barn will be open on the May 7th Bank Holiday and the Jubilee Bank Holidays on June 4th and 5th, 10am-4pm. We hope to welcome you for a visit around the building to take in the Abergavenny Tapestry, the interpretation exhibition exploring the history of the site and the town, and the fantastic food and drinks in our Food Hall. We hope the weather may have improved by then as well, enabling visitors to enjoy the sun sat outside in our beautiful courtyard. 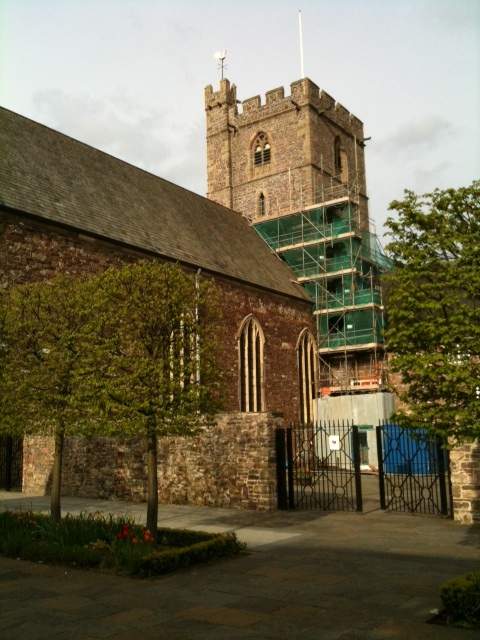 The scaffolding at St Mary’s Priory is continuing to come down. As sections are removed, pointing work is being undertaken on areas that couldn’t be reached while it was up. The last time this was undertaken was around 100 years ago to mark the coronation of George V – so there is a nice link to the work being completed in 2012, as we celebrate the Jubilee. Churches in Abergavenny are getting ready for a Big Jubilee Lunch – and the Revd Mark Soady is making sure there’ll be enough salad to go with the planned picnic. 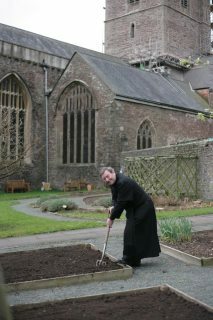 Fr Mark, VIcar of Abergavenny, spent a couple of hours getting a vegetable patch ready to plant lettuce seeds which were sent to St Mary’s Priory Church as part of the Big Jubilee Lunch pack, available from www.thebiglunch.com. The event on Sunday, June 3, will see members of the congregations, friends and family from St Mary’s, Christchurch, and Holy Trinity in the town, and St Peter’s, Llanwenarth Citra, get together for a bring-and-share picnic, complete with entertainment and games for the youngsters. Starting at 12.30pm, the picnic will take place in the Priory Centre, the church and Tithe Barn courtyards and Vicarage gardens.